Only one day to go until the launch of Sheena's new range "A Taste of India". Don't forget to set everything to record tomorrow at 8am, 1pm and 7pm. 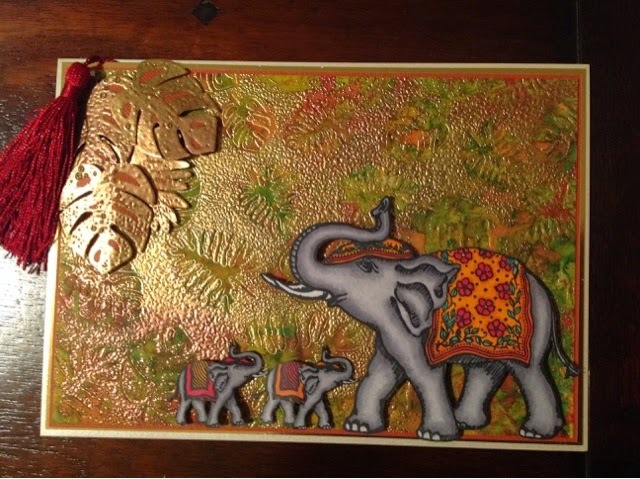 This sample is made using my favourite stamp of the elephants, also the leaves and the leaf embossing folder. I distressed some centura pearl card using dried marigold, peeled paint and mustard seed, then put Versamark onto the embossing folder and ran the card through my Ebosser. I then randomly sprinkled gold embossing powder over the embossed image. I loved the end result, so added a elephant family. Hope you have a great Sunday. Take care andll be back tomorrow for my lays sneak peek. WOW this sure is Stunning, loving the cute baby elephants.